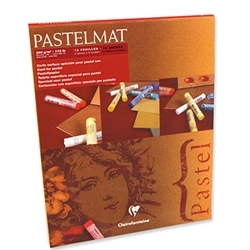 Pastelmat Card for Pastel Pads - A beautiful acid free cardstock for pastel. Very fine sanded surface adhered to an acid free, 170lb sheet. Suitable for pastel, pencil, and charcoal. These pads feature three sheets each of four colors, for a total of twelve sheets per pad. Each sheet has an acid free glassine cover sheet.